^^ Bonus terms: 18+. New customers only. Minimum deposit of £20 required. 48x Wagering requirements on both the money and spins bonus. Maximum bonus bet is £5. Limit of withdrawal from Bonus Spins winning is £200. Any unused extra spins and, or, bonus money will expire after 7 days. Full T&C Apply. Writing a review for Guts Casino and sportsbook is not hard, the product really sells itself, particularly the gambling aspect of it — the sports offering does not stack up against the big UK bookies. Guts.com, which launched in 2013, has been revamped in August of 2018 and is a gambling site to watch out for with casino, live casino, sports betting and poker all available. The fact the site employs multiple leading software developers as well as garnering a solid reputation for a secure gaming environment, it is considered to be one of the best in the industry. Featuring a gaming catalogue of over 500 traditional and unique titles including slots, progressives, table games, casual games and more, one aspect to the online casino which puts it ahead of its competitors is the fact it offers some of the fastest withdrawals on the market. When you open an account at Guts online casino you instantly receive 10 free spins on Piggy Riches. Simply sign up and locate the game via their search bar to take advantage of this offer. There are wagering requirements for the Guts bonus – the first three deposits and bonuses need to be wagered 35x times, while the fourth needs to be wagered 45x times (wagering requirements for 200% or above). The best part to the Guts bonus, is unlike many other online casinos this one doesn’t require wagering requirements on any winnings accrued on the free spins, including the 10 free spins rewarded for registering. Additionally, Guts holds day-specific promotions including Monday and Thursday promotions, as well as temporary bonuses for players to take advantage of regularly. 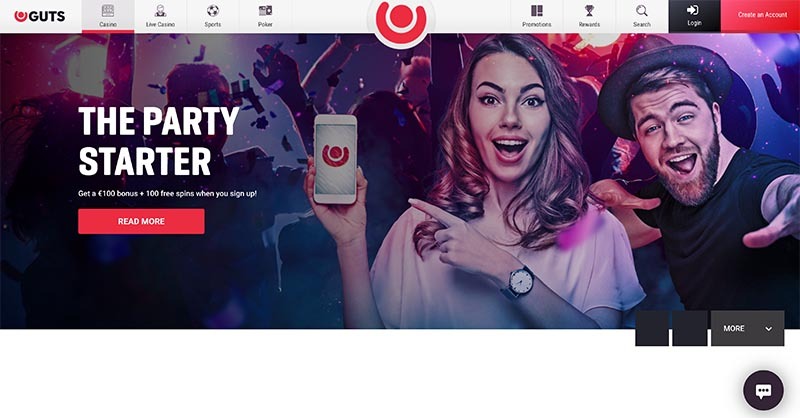 Although it is uncommon for an online casino not to offer a loyalty program, Guts online casino doesn’t offer any rewards for regular players. Although you will find plenty of other offerings available under the promotions tab. Guts online casino is a no download platform meaning players can access titles simply by clicking on our links – the site is compatible with both Mac and PC users. This means the games available are all flash games, so there is no need to download any software, which takes up space on your device, to access the 500+ gaming catalogue. We take a look at what’s on offer at Guts online casino in terms of their games and detail each category available on their easy to navigate menu panel on the left hand side of the screen. There’s also a convenient search bar at the top of the menu panel for players who know what title they are after to find straight away. There are over 1000 real money games available at the time we last updated our Guts review, however you will find that some games won’t be available to some countries. For example if you are in a regulated market and Guts has games available from a software provider that does not have a license in that specific country you will not see those games. If you are in the UK for instance, you will see most of the games suite, including a big selection of live dealer games, slots, RNG titles and skill games. Another huge benefit of Guts.com is they are constantly adding more titles to their website, with most weeks featuring new release titles. Guts casino has conveniently split up their slots catalogue into easy to navigate subcategories, with their first being video slots. There are almost 400 titles available from a variety of software developers, such as Guns N’ Roses from NetEnt, Peek-A-Boo from Microgaming, and more. Next on the menu panel are the classic slots, with over 40 titles available including Microgaming’s Break Da Bank, and Play’n Go’s Irish Gold. Fruit machine players will be sure to find a title they enjoy. The last category for the slots includes 3D games, with over 60 titles predominately created by the 3D graphics experts, BetSoft. Popular choices include Greedy Goblins and Pinocchio both by BetSoft. There are 16 blackjack titles available at Guts online casino, with both traditional and unique variants available from Microgaming, Net Entertainment, and BetSoft. There are 15 roulette titles available, including French, European, and American roulette, as well as more unique titles all with an array of table limits. There are a number table games, including baccarat, craps, and poker, however it is important to note Guts casino now have a dedicated virtual poker room so we recommend heading there for your poker variants (see below). There are over 15 video poker titles, which is quite limited for an online casino with the majority of the titles developed by Microgaming. The progressives also get their own category with both the most popular large networks jackpots, including Mega Fortune by Net Entertainment and Mega Moolah by Microgaming on offer as well as many smaller progressive titles being available. The best part is each progressive has the jackpot amount on the game’s icon so you don’t have to click on each title to find the largest on offer. The more casual games available are found under the ‘Other Games’ category including keno, bingo, scratch cards and more. Guts is powered by the top software providers including Net Entertainment, Microgaming, BetSoft and more and the catalogue is available on one platform accessed across all devices via your web browser – Firefox, Chrome, Safari, etc. As part of the Guts.com relaunch they added in a dedicated live casino section which is easily accessible from the top menu of the website. Front and centre in this section is an ongoing blackjack promotion which rewards players for landing blackjacks on any Live Blckjack Evolution games. This section is easily to navigate with a menu listing popular games which will quickly jump you to where you want to be. You will find all of your casino mainstays like blackjack, roulette, baccarat and variations of poker. There are also some unique new titles like the exciting new game from Evolution called football Studio. The table limits should be favourable enough for most players, with the lower end being $1 per hand on some games, while others go all the way up to about a $10,000 maximum limit per hand. Guts now offers a virtual poker room for dedicated poker fans – simply click on the ‘Poker’ link at the top of the main menu panel next to ‘Casino’ and ‘Live Casino’ to access. The poker offering is part of the Microgaming Poker Network which gives the games much more liquidity than they would have if it was just Guts’ players in the games. Inside Guts’ poker section you will find Texas Hold’em No Limit and Fixed Limit, Omaha Hi, Omaha Hi Low, Razz, Card Stud, Card Draw, and 7 Card Stud, as well as regular tournaments against other players. Another great initiative at Guts Poker is the 1000 unit welcome bonus, which is released to players automatically in batches of 5 units, when you contribute 25 units to the rake. All you have to do is create a poker alias once you are a member of Guts online casino to play. The Guts sports betting component of the website was launched after the online casino, but it has definitely gained a solid following and has continued to improve, with more and more markets being added over time. At the time of writing this review the sports section had around 30 different sports to wager on, with football really well covered right around the world. The diversity of the markets on offer is highlighted by Guts having Australian rules football, esports tournaments from around the world and volleyball all available. The bookie also has a great service which provides statistic for upcoming sports events, in-play scores and the option to bet live while events are on. We did a quick scan to see how Guts.com matches up to Pinnacle.eu for odds and we found this project to be favourable towards the UK licensed bookie. You can use all methods for withdrawals except for MasterCard, with Skrill, Neteller and paysafecard all offering instant withdrawal processing times – a feature you won’t find at any other online casino. Additionally, each transaction you make irrespective of the payment option you select is protected by modern data encryption technology to ensure all player’s details are protected. Guts online casino is also governed by the Malta Gaming Authority, a respectable gaming jurisdiction which has confirmed the site offers a fair gaming environment for players, as well as regular payouts. 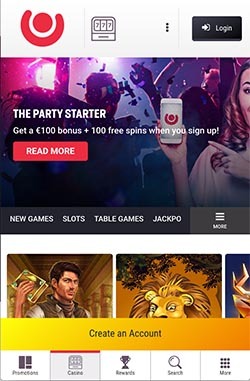 Guts online casino also offers a mobile version of the desktop site, featuring over 100 titles optimised for Apple, Windows, Android, and other smartphones and tablets. You will find many online slots games available on mobile, while there is also a good selection of RNG table games at your fingertips. Live dealer by Evolution Gaming is also available via your handset. Simply tap our links and access the site as you would on your desktop or laptop. For starters during the sign up process at Guts you will have to hand over your mobile number and then the casino will send you a text with a code. This verifies you are in an eligible country. If you do not have a mobile phone you will have to contact customer service to avoid this part of the process. The casino will also want to verify your age and if you are in Great Britain you only have 72 hours to complete this phase of the verification before your account is put on hold. The casino also has the right to freeze any withdrawals until you have proven your identity, to do this you will either follow an online process, or send in documents. If you cannot use the online verification contact customer service and they will talk you through the manual verification process which is likely to involve you sending in some documents, like a copy of your drivers license or an old utility bill. Guts.com and its parent company Gaming Innovation Group have come a long way since launching in 2013. Since then GiG have launched several other brands including HighRoller.com and Rizk.com. What we are saying is that this company is no joke. In August of 2018 the company also announced it was entering into the sports betting market, with its own product, which they will attempt to white label to other operators. Overall if you are looking for an online casino with a good spread of games under a trusted jurisdiction, Guts.com is a good choice. We have been playing at this casino for a long time, before beginning this website, so we write our Guts review from a strong standpoint.